The URX-P03 portable receiver forms part of a complete UWP-D audio system offering the sound quality of digital audio processing combined with the reliability of analog FM modulation. Easy-to-use features include a large display and small size to fit neatly on any size camcorder or DSLR camera, automatic channel setting function, headphone output, USB connection for power supply and line input availability. The UWP-D Series system provides superb transient response performance for all ENG / EFP production applications. Improves transient response performance between the UWP-D transmitter and receiver, which will provide impressive natural sound quality compared to conventional analog wireless systems. 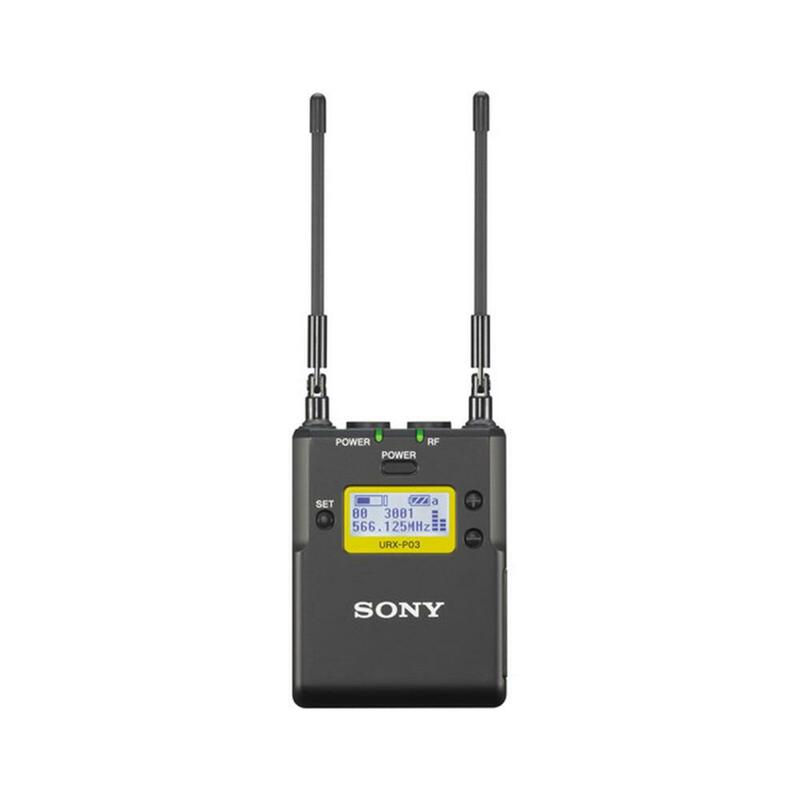 The UWP-D Series wireless microphone systems uses Sony Digital Audio Processing to improve sound quality and transient response performance compared to conventional analog wireless systems. It provides superb transient response performance. Analog companding systems cannot accurately reproduce sounds such as a bell, tee shot or handclap, but Sony Digital Audio Processing reproduces them faithfully. The UWP-D Series transmitters and receivers are also compatible with Sony?s WL-800 Series, UWP Series and Freedom Series, allowing users to switch between different companding modes. The URX-P03 portable receiver has a micro USB terminal for connection to USB external portable power sources allowing the unit to be powered by the camcorder during use, resulting in hassle free power. You can also load NiMh batteries into the receiver to be charged through the micro USB. The URX-P03 portable receiver is made of strong, durable metal. Metal construction supports reliable use in rough operating conditions.